Tim wanted to Thank everyone who has shared, discussed, and reached out to him regarding this story. The outpouring of support has amazed and humbled him. As many of you know, Western Express issued a statement on Friday that Tim quit and that he was never fired. Tim is standing by his original statement that he was fired and has clarified that they did offer him his job back, but he no longer felt that working for this company was in his best interest. He also explained, it was difficult to reach him last week because his family was moving. Since the press release, Tim spoke with the CEO of Western Express Saturday evening and explained the same. Tim has accepted another offer with a different trucking company and will start 10/1/17. Please understand that Tim did not at any time ask me to set this page up, I did it to help show my gratitude for what he did for my family and my community. As of today, there has been zero money withdrawn from this fund. Understanding that there are two sides to every story, Tim wanted to let anyone who feels the press release from Friday changes their wish to donate or support him know, that funds can be returned to you. If you would like a refund, please send a private message through go Fund Me before 9/25/17 and we will initiate the refund. On 9/25/17, Go Fund Me will open the remaining funds up to Tim for withdrawal. Thank You again to everyone who donated!! But these are not your only options, so many need help. I woke at 3 the morning of 9/9/17 to the news Irma shifted further west, strengthened, and was now predicted to hit just south of my area and I felt fear. I knew we had supplies but we had been unable to find plywood other than 2 sheets family was able to save for us. As we we were faced with 120 mile per hour wind gusts as the storms eye passes close to our area, I was not sure what to do. My sister and I began talking about our options and since it said Home Depot opened at 6am she decided at 5am to take a chance and go wait in line. I was waking the hubs up to find out what screws we needed before heading out to lowes to do the same thing! 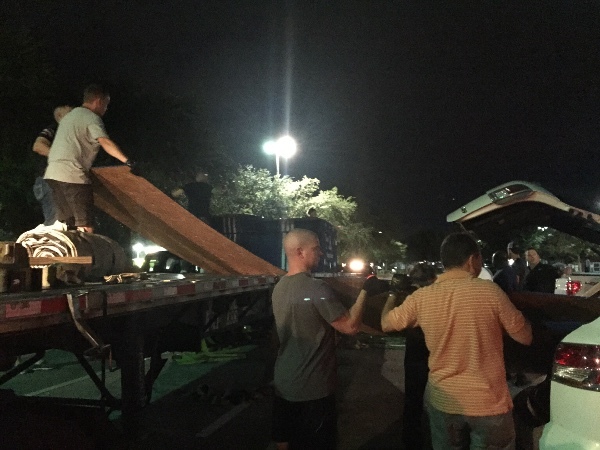 What an amazing blessing this was... As it turned out, a truck driver named Tim McCrory hauling plywood for Western Express from SC had a flat tire earlier Friday morning. Knowing how badly FL needed plywood, he waited for 7 hours to get the tire changed. As a result, he got to our Zephyrhills Home Depot to late and they refused his order. With no other options, and being exhausted from trying to get here, he decided to sleep for a few hours in his truck before getting back on the road. As luck would have it, one of Tampa's finest Jesse Madsen went to Home Depot early to get in line with the off chance they had plywood. Once he learned Home Depot had refused the order and the driver Tim learned how badly the area needed the plywood... He opened his shipment up to everyone who was there FREE OF CHARGE!!! What!!! In this day and age??? Even though we were all strangers, I cannot explain the sense of community I felt with those of us who were there lucky enough to not just receive plywood, but also receive a much more important gift... Compassion from a man who will risk getting caught in the storm driving back to his home to bring us wood, who also risked his job to make sure regardless of Home Depots refusal to accept his order that Zepyrhills would have some plywood.... Everyone was so nice, patient, helping each other to get only what was needed. As Huston showed us before, in times of need no matter where you come from, no matter what you look like, no matter where you live... As a nation we are still a community and we all need to remember Tim's Dads creed: Do right by others and help when you can!! I shared this Saturday morning and my family continued to prep for the storm, then brace for impact. We consider ourselves lucky, though we got what was left of the eye wall when it hit our area, our house was fine and we were safe due to Tim's choice to help those who needed it. All this weekend Tim has continued to check on us and we have found out that Western Express Trucking has decided to let him go for his choice to help our community. The fact that his company is not standing behind such a wonderful deed is absolutely unacceptable!!! As soon as we were safe, I tried to use my cellular data to set this up but I couldn't get it to work. We just got power back today; which is why this is so late, please share. Help us make this story go viral for Tim and help us raise money for him since he lost his job showing us kindness. My goal is to bridge his family financially until he finds new employment. Tim will be the only one with access to the funds to withdrawal as needed to support his family until he finds employment. My family and our community did not know Tim or his generosity before 9/9/17. Thank you again to everyone who shared and donated. Wow its amazing we were able to raise this in such a short time. The outpouring of support for Tim and his choice warms my heart and I am so glad we started this. I have increased the goal in hopes we can help make the job transition easier for Tim and his family. Again, our goal is to share the story, no obligation to donate.